Happy New Year, it is 2011, a year full of promise, hope and positive goals. 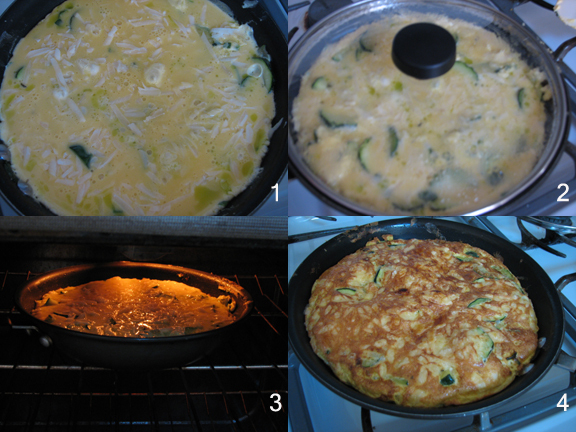 Today I made a new recipe, which will be my first recipe in my Frittata cookbook. Keep looking at my blog for the latest updates of how the book is coming along. The book will be unique. Heat up a 10” non-stick sauté pan with olive oil over medium high heat. Add sliced mushrooms and sauté for about 5 minutes. Add the chopped sun dried tomatoes and sauté until tomatoes are partially re-hydrated (a little bit plump), about 2 minutes. Add the chopped baby spinach and sauté for about a minute, the spinach will wilt from the heat. Break six eggs into a bowl. Add the 2 egg whites and discard or save the yolk for another use. Whisk the eggs well. Add half the grated Parmesan cheese, whisk well, and add to the sautéed vegetables. The egg mixture should cook until almost gel-like in the center. Sprinkle the rest of the Parmesan cheese and parsley on top of the eggs. 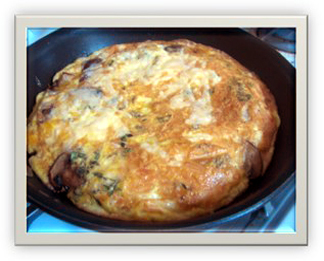 Place pan in the broiler for about 3 to 5 minutes until the cheese is golden brown and the eggs are set in the center. Remove from the pan using a spatula and cut into wedges. Serve with whole grain toast and butter. Enjoy! 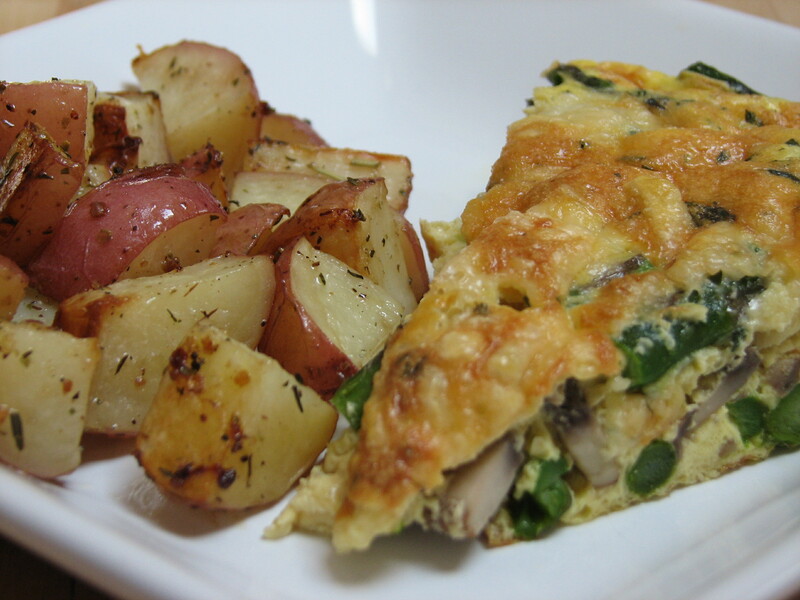 I have been thinking of different ways to make different kinds of frittatas. I am obsessed with them because they are filling and can be made with different things such as vegetables and often instead of eggs I use an Egg Substitute to cut down on the fat and cholesterol. I was at a friends house for a couple of days and she had some potatoes, onions and mushrooms left from the previous nights dinner so I thought let’s try a new thing. Talk about a wow factor. This was excellent. Hope you enjoy this as much as I did. Heat up olive oil in 10” sauté pan over medium high heat until hot. When In a 10” sauté pan, layer the potatoes evenly around the pan, and then layer the thinly sliced red onion on top of potatoes along with the mushrooms. Cook over medium high heat for 5 minutes on one side and flip everything over so that the mushrooms are on the bottom with onions and potatoes are on top. Cook for another 5 minutes until the mushrooms, onions and potatoes are a deep brown and caramelized on both sides. 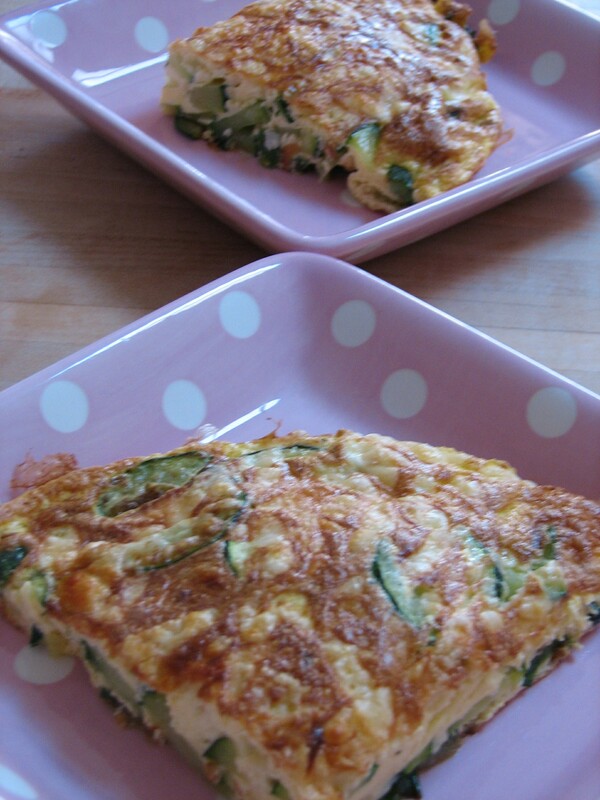 Beat 10 eggs together, reserve 3 tablespoons of parmesan cheese, set aside. Add the rest of the parmesan cheese and fresh thyme in eggs beat well. Add the egg mixture to the to the potato/onion mixture. Cover for about 5 -7 minutes until the middle of the frittata is set. Sprinkle remaining Parmesan cheese over top of frittata and put under a boiler for 3 to 5 minutes until golden brown on top. Serve with sliced tomatoes or meat of choice. I have fallen in love with Frittatas. I make them every chance I get using Egg Substitutes because I am trying to lose weight due to my diabetes and cholesterol problems. I found this recipe in the Diabetic Living Fall 2008 magazine, which is one of the best magazines for great recipes for diabetics. Often, diabetics are challenged when it comes to food and coming across this recipe was a great find. With some tweaking to the original recipe that suits my taste, I tested this recipe this morning and its is delicious. Enjoy! 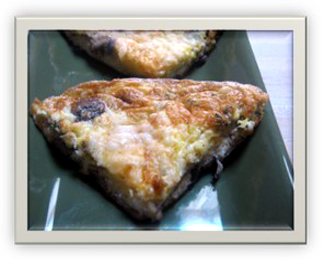 Turn on broiler to lo-heat, adjust your oven rack so that the frittata can be flash broiled in the oven for 5 minutes. In a medium bowl, mix the container of egg substitute with thyme, and Parmesan cheese leaving about 1/8 cup to sprinkle on the top later. Set bowl aside. In a oven-proof 10” sauté pan, heat the olive oil over medium-heat and add the zucchini and green onions. 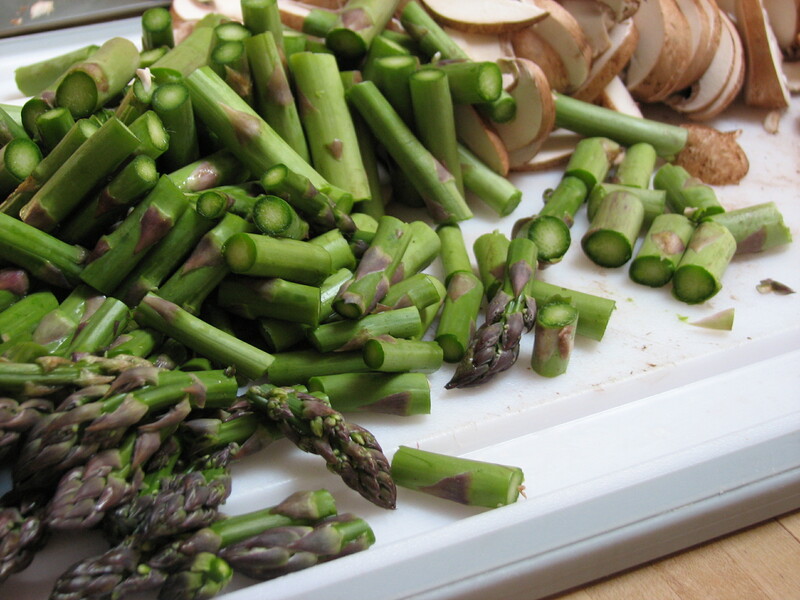 Sauté the vegetables for about 5 minutes until they are tender but still crisp when biting into the vegetables. Add the egg mixture to the vegetables and reduce the heat to medium. As the mixture is cooking and becoming set, run a spatula around the edge of the skillet lifting the egg mixture so some of the egg drips underneath. Cover with a lid and cook for about another 2 minutes so the egg will become more set, showing a little bit of liquid in the middle. Remove the lid, sprinkle the remaining parmesan cheese over the egg mixture, and place the sauté pan in the broiler until the top is golden and the egg has become firm. Remove from the broiler wait a minute and then cut into wedges and serve warm. I love Saturday mornings. I love the fact that I can make dishes and try out new things. Most of all I enjoy the ones I’ve already created. 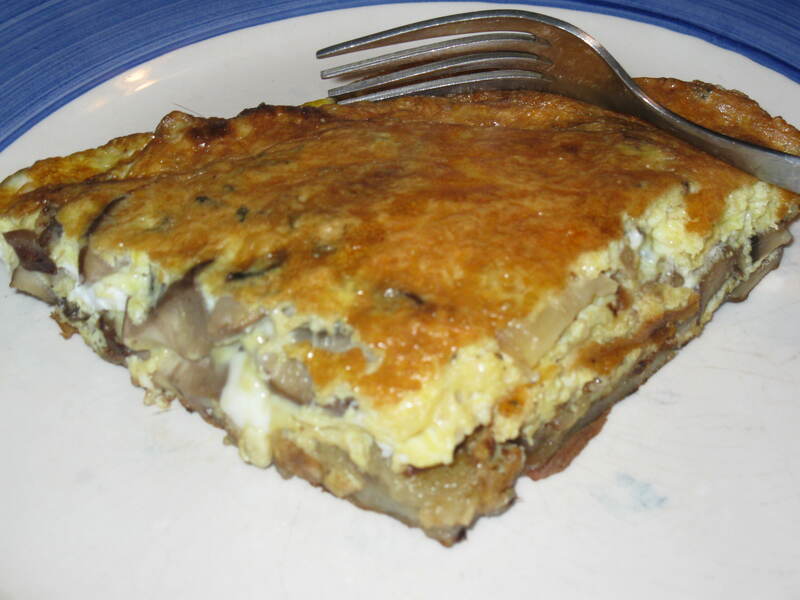 A mushroom frittata loaded with Parmesan cheese and mushrooms – what can I say! I love mushrooms, eggs, Parmesan cheese – need I say more? An excellent 5-ingredient combo that can be used for all meal times in the day – breakfast, lunch, brunch or a light dinner. 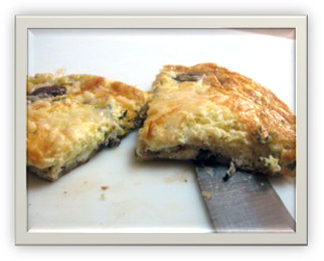 ½ pint of mushrooms – any kind you like – in this one I used ¼ baby portabellas and ¼ button mushrooms – wiped off and sliced. You can certainly add more mushrooms if you want. 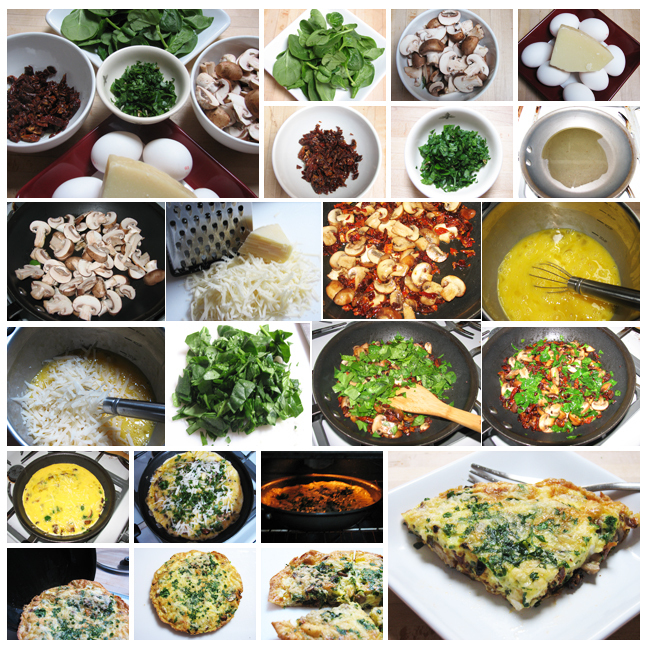 1 carton of Egg Beaters (I used this because I found that with Egg Beaters, the frittata is fluffier. Not only that, there is no cholesterol and fat in Egg Beaters and I can eat this at anytime and often. 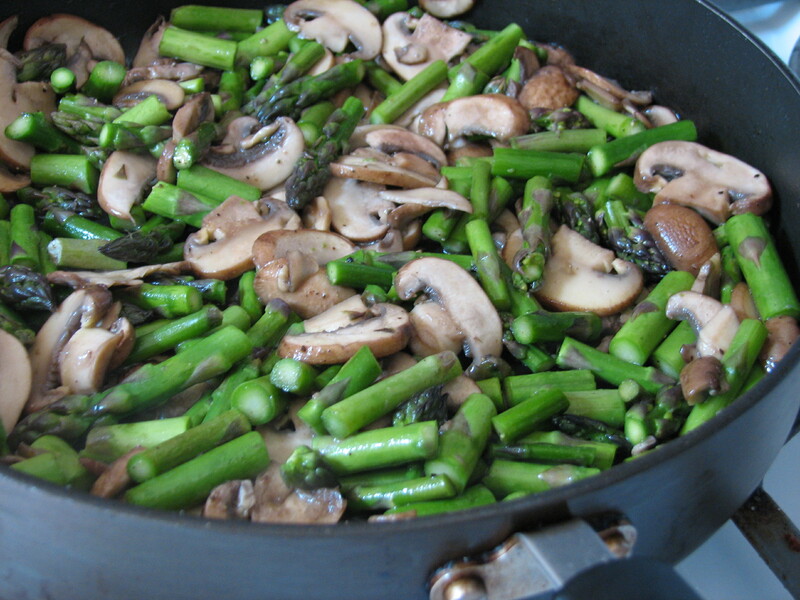 In a 10” sauté pan, heat up the olive oil over medium high heat and add the sliced mushrooms. Add about 1 teaspoon of salt and let the mushrooms cook until the desired consistency. I like my mushrooms cook thoroughly but still has a bite to it. Add the carton of egg beaters to the mushroom mixture. Add the parmesan cheese and leave a little bit for a final sprinkling after taking the frittata out of the oven. Add the thyme and just lightly mix the cheese and thyme into the egg beaters. Try not to stir the mushrooms around; you will want to leave them on the bottom of the egg mixture. Cover the pan with lid for about 3 to 4 minutes. The eggs will cook. Remove from the heat and sprinkle the reserved Parmesan cheese and put in the broiler for about 2 to 3 minutes so the top is brown and the cheese is melted. Yum! 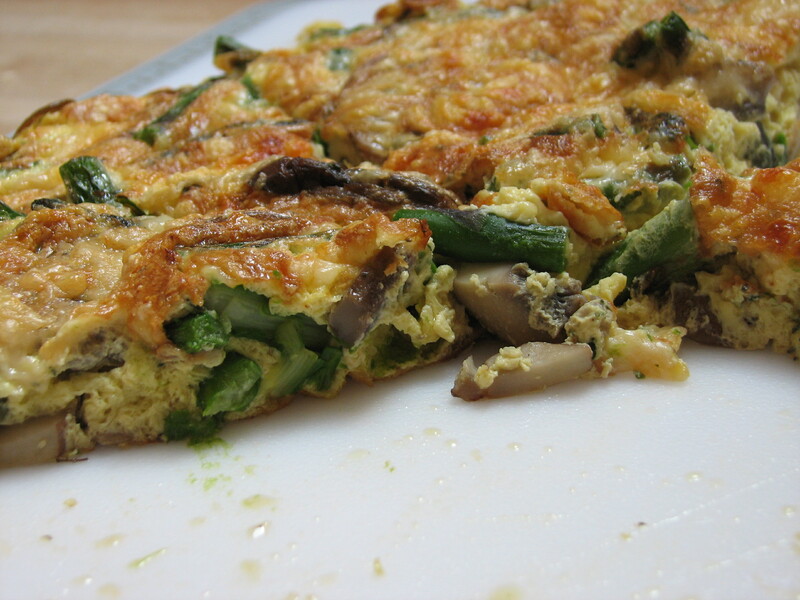 Remove the frittata from the broiler and slide the frittata onto a cutting board and slice half and then half again. Serve this with crusty whole grain bread and butter with a cup of freshly perked coffee or tea. I love Saturday mornings.